Put the beetroot pieces on a baking tray with 1 1/2 tbsp olive oil, salt, and pepper, and mix to coat evenly. Cook for 15-20 mins, turning over with a spoon half way through. Toast the pine nuts in a dry frying pan, stirring occasionally. Do stand and watch them as they can burn very quickly! Set aside in a small bowl. Heat the remaining 1 1/2 tbsp oil in a pan, and over a low heat cook the spring onions and garlic until brown. Add the chickpeas and cayenne, stir, and cook for a further 5 mins or so. Add the cooked beetroot to the pan and stir to mix. Meanwhile, make the sauce. Put all the ingredients in a small blender and process until smooth. Adjust seasoning to taste. Toast the pitas and then slice open into pockets. 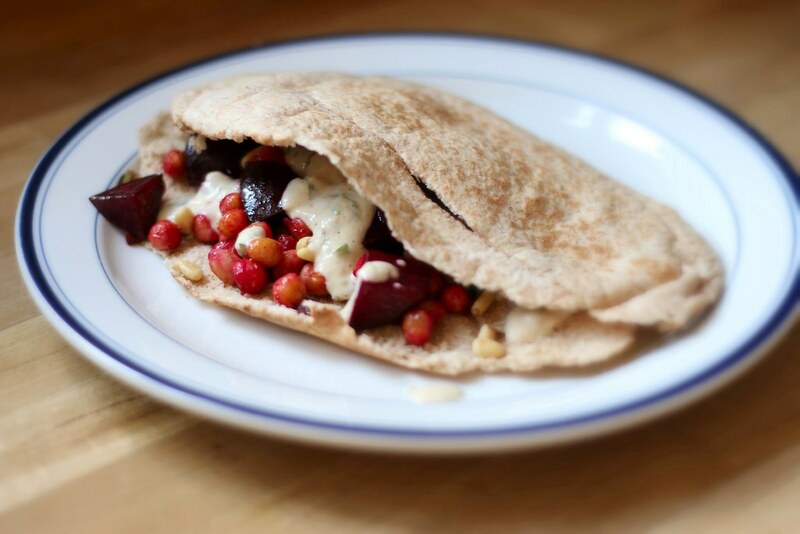 Spoon in the beetroot & chickpea mixture; sprinkle over the pine nuts; spoon over some of the sauce. Serve immediately and be prepared for a slightly messy (but thoroughly enjoyable!) meal.